Whale Watching in Maui gives you the chance to get close to some of the world’s most majestic and mysterious creatures: humpback whales. In the winter season, thousands of humpback whales, or Kohola, make the trip to Maui to mate and give birth in our shallow, protected waters. 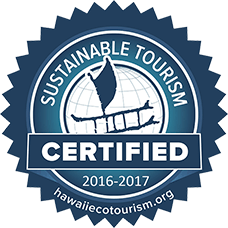 This makes Maui one of the best places in the world for whale watching and one of the top 10 things to do in Maui. 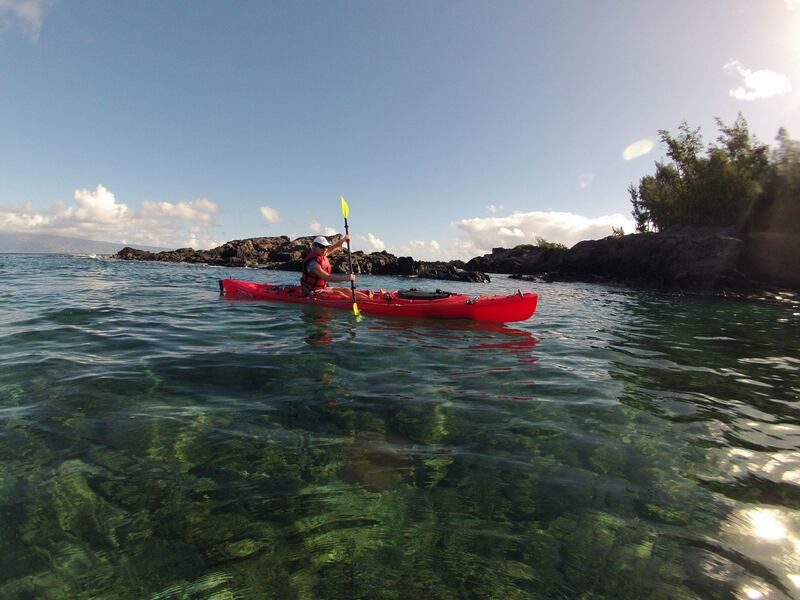 During January through March, join us for one of the most unforgettable Maui activities. This tour is solely focused on whale watching. 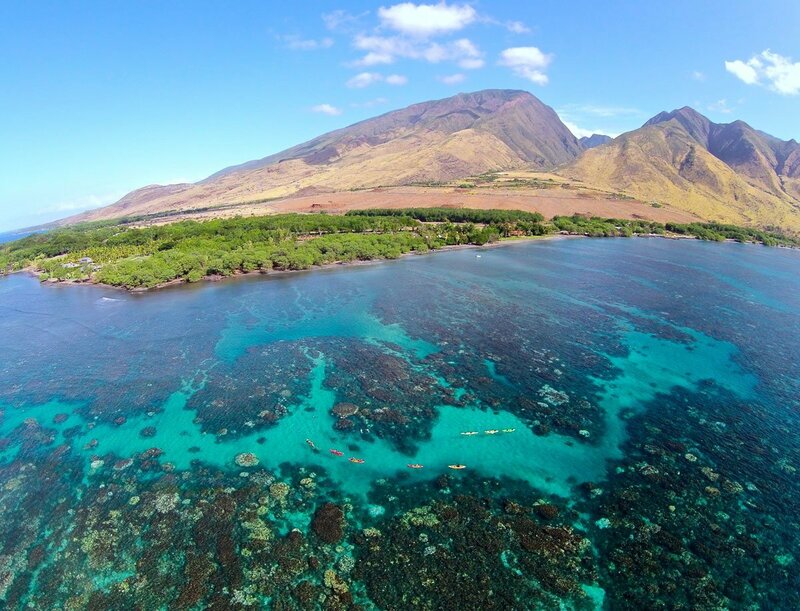 If you would like to see additional fantastic marine life Maui has to offer, we encourage you to check out our combination Whale Watch and Snorkeling tour below. This is a Whale Watch Only tour. If you would like a combination Whale Watch and Snorkel tour, check it out below. Close humpback whale sighting and song, dolphins, turtles, and other local sea life, unforgettable! Curtis and Chris were amazing! More than we hoped for, absolute best activity on our whole vacation! Humpback whales are some of the most majestic creatures the ocean has to offer, but they are not the only marine animals to see in Maui. If you are interested in watching whales as well as sea turtles, tropical fish found nowhere else on earth, manta rays and several other treasures, this four-hour tour is for you. As you paddle out, your certified marine naturalist Guide will share facts about the Humpback Whales that migrate to Maui to breed and give birth. 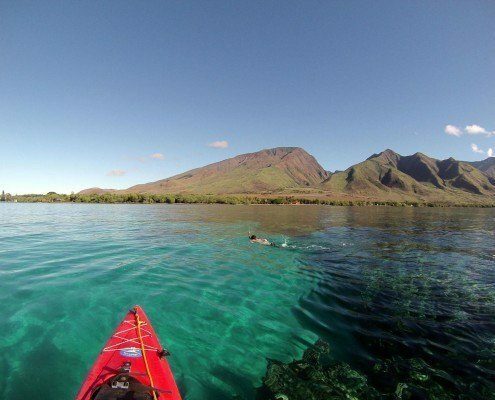 After some time whale watching, your Guide will paddle back along the coastline to popular snorkeling spots. 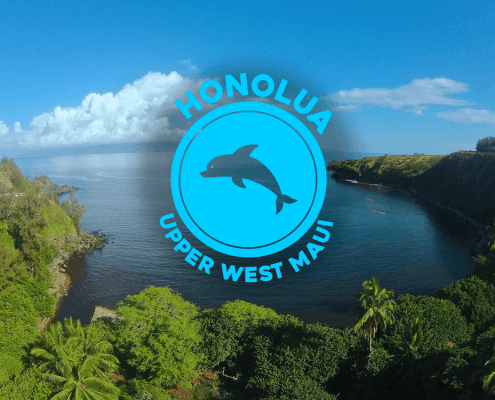 This longer tour is perfect for paddlers who are looking to split their time viewing the humpback whales and snorkeling to see other marine life (it is against the law to snorkel with humpback whales). The additional hour gives you the time needed to observe and enjoy without being rushed through the experience. Ability to swim is required for booking a group tour. If you do not know how to swim or want to choose how you want to spend your time, a private tour is an option. 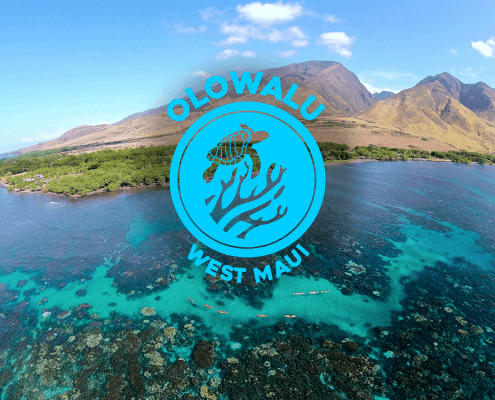 Departures from Makena Landing on the south side of the island as well as Olowalu on the West Side are available. This is a 4-Hour Whale Watch & Snorkel tour. If you would like to focus solely on whale watching, please check out the tour above. Your guide has your complete attention. If we have 10 in a group, we will send a second guide so you get an even better tour! Your guide will lead you safely to the best spots for catching some great whale activity. Most companies charge an additional $40-$60 for photos. With us, you’ll get digital web photos from our tour guides using GoPros for FREE after the tour! We’ll get all the special moments, from start to finish so you can just relax and enjoy the tour. Choose to leave from Makena or Olowalu, either location will provide an experience you will never forget. 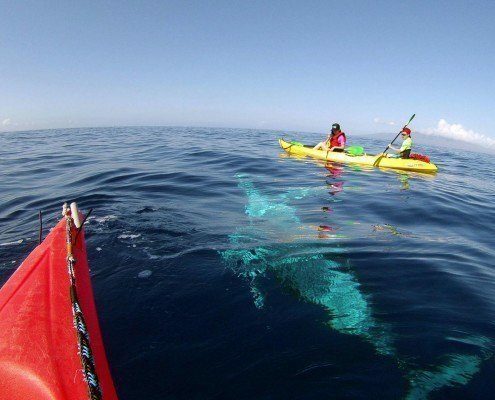 Whale Watching From A Kayak! There is NO better way to see these gentle giants than right on their level from a self-powered kayak. No engine or crowd noise and no diesel fumes… just you, our guide and the Humpback Whales! During our 4-hour whale watch and snorkel tour, we will end the trip with a visit to our favorite snorkeling reefs, where you can snorkel with green sea turtles. Usually, if whales are close, you will be able to hear their whale song the deeper and quieter you are underwater. Away from the crashing waves, and splashes of others, connect with the humpbacks on a deeper level. In all seriousness, the photo above is a once-in-a-lifetime experience. It is VERY RARE that the whales come this close to our tours. No vessel is allowed to approach a humpback whale within 100 yards, but sometimes they swim a little closer to us. 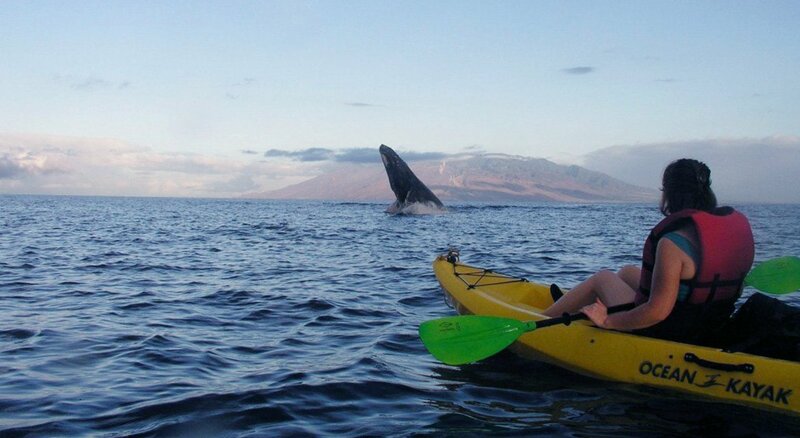 When & Where is the best place on Maui to kayak with Whales? Have you noticed Humpback Whales while sitting at the beach, driving along the pali (please only look if you’re in the passenger seat) or from your hotel room balcony? Well, that’s because the whales are everywhere…the water off Maui’s south and west shores is the most populated area for Humpback Whales in the entire world during our whale season: December through April. However, if you’re lucky enough to be here in February you’ll get to experience ‘whale soup,’ this is what locals call our ocean during the peak of whale season. 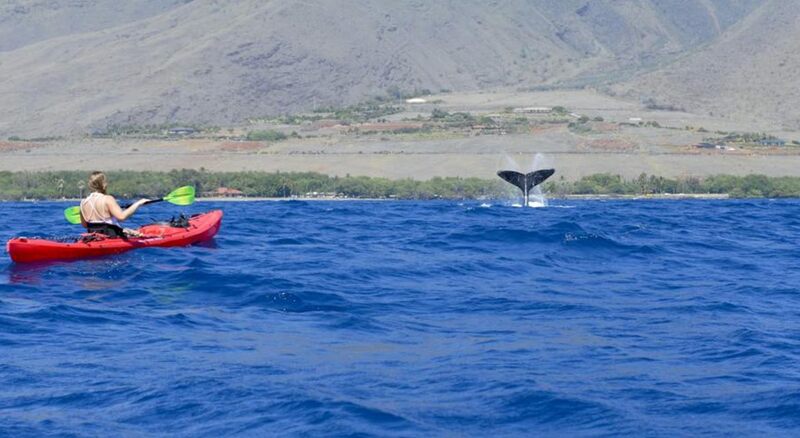 In February, it’s not a question of if we’ll see humpback whales… it’s ‘how many and which ones do we want to paddle to see?’ There are so many whales that come to Maui each year that the United States Congress designated our waters as a National Marine Sanctuary in 1992. 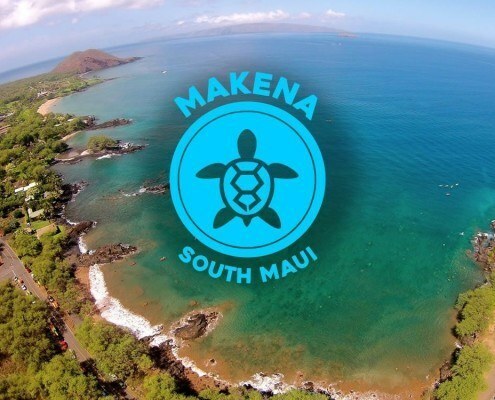 We have two great departure points for whale watching: Makena on Maui’s south shoreand Olowalu on the west side of Maui. No matter what resort you’re staying at, we have a location close to you, but it’s best to check with our knowledgeable team on where the best conditions and whale sightings have been. 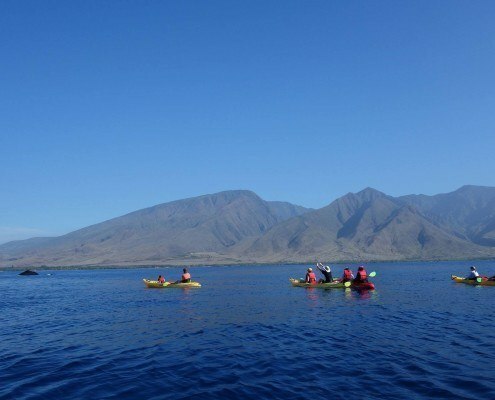 When you book one of our whale watching Maui tours, you’ll be able to choose whether to paddle out from Lahaina side at Olowalu or Kihei side from Makena. 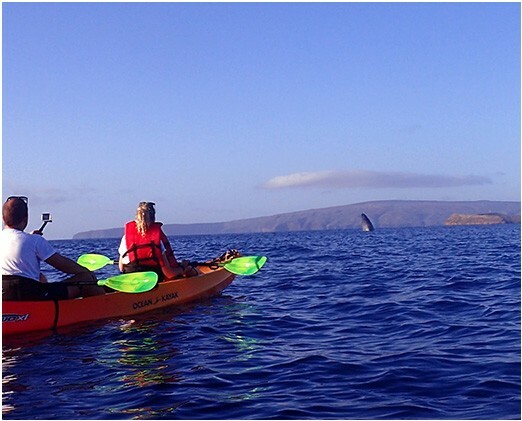 Each of our passionate kayak guides is certified marine naturalists and will share their love of Humpback Whales and Maui with you as you paddle alongside. During peak whale season, February and March, we typically see several pods of humpback whales on our tours and if we get lucky, we’ll see a competition pod or a brand new baby calf! Some other whale activities you could see are peck slaps, fluke slaps, spy hops and a lot of ‘spouts’ when they come to the surface to breathe… if you’re REALLY lucky you might see a whale breach! We do not guarantee whale sightings on any of our Whale Watching tours. Nature is unpredictable and it’s a big ocean, the whales are in charge of where they play. Peak whale season is February and March, however, we start seeing Whales as early as December and as late as April. If you’re curious about what the likely hood is of seeing whales when you’re here please ask our management staff, but keep in mind during shoulder months we can see whales for several days in a row then not see any and we can also not see any for a week then see them. 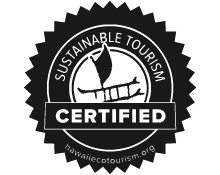 Either way, you’ll have an epic experience paddling in the waters off of Maui and learn a lot from our certified marine naturist guides. 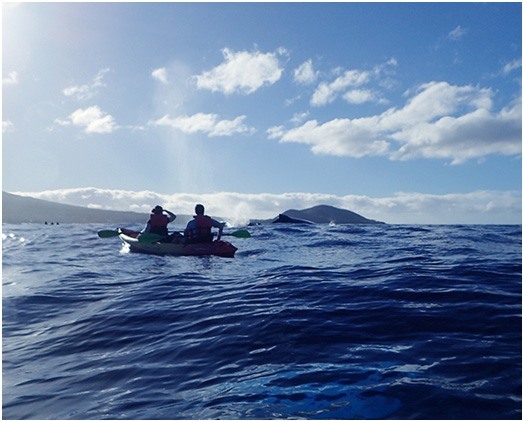 Relax on a casual kayak adventure where you’ll be close to several pods of majestic humpback whales! 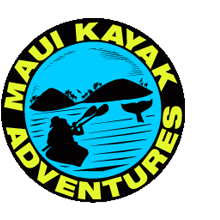 and staying in Maalaea, Kihei, Wailea, Kaanapali, Napili, Wailea, Kapalua, Makena, Lahaina or Olowalu, call Maui Kayak Adventures to schedule your whale watching Maui tour. 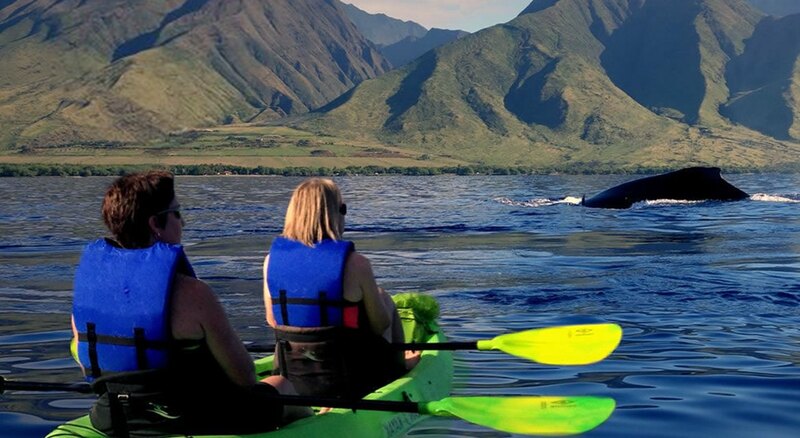 This is a once-in-a-lifetime experience, so don’t wait to schedule your whale watching Maui tour with us! 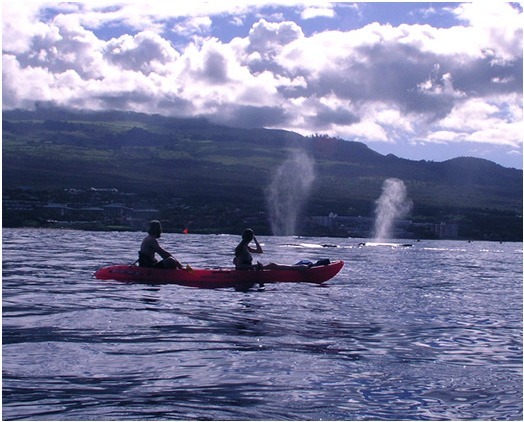 Avoid the large boats carrying 100 people and enjoy watching humpback whales in Maui from a kayak.